In celebration of 20+ years since their classic debut Uptown Saturday Night, Bronx duo Camp Lo present a special double-album 2XLP with On The Way Uptown & The Get Down Brothers. On The Way Uptown features a collection of demos and unreleased songs made between 94’ – 95’, leading to their official debut in early 1997. Aside from the early versions of their hits “Luchini (AKA This Is It),” “Sparkle,” “Black Connection,” and “Coolie High”, other standouts include “World Heist”, “Coolie High Is Life” & “A Piece of the Action”. 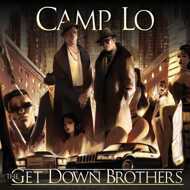 On The Get Down Brothers, Camp Lo completely pivot away from their 90’s nostalgia into a much more futuristic and experimental sound. Although the production is different, their signature tongue-twisting and hype flows remain, creating a unique and seamless fusion packed into 10 dynamic tracks.